Some of the debris found by beachgoers who place it next to one of the new warning signs. THE City of Fremantle will close Port and Sandtracks beaches if more asbestos, rocks and rubble is found where the public swim, run and winter surf in North Fremantle. The city’s infrastructure director Graham Tattersall said daily inspections were being conducted at the beaches. “If it is determined the condition of the beaches is unsafe, they will be closed and additional temporary signage erected,” he said. Since January, historic dumped debris and buried former Fremantle Port (FPA) infrastructure in adjacent sand dunes has appeared on the beaches, washed into surf zones and moved north to Leighton Beach. Last month, Community News revealed that the Fremantle Port Authority (FPA) agreed in 1995 to remove debris from its land reclamation at the adjacent Rous Head container yards, but that requirement was missing from the previous State government’s approval for the reclamation in 2009. 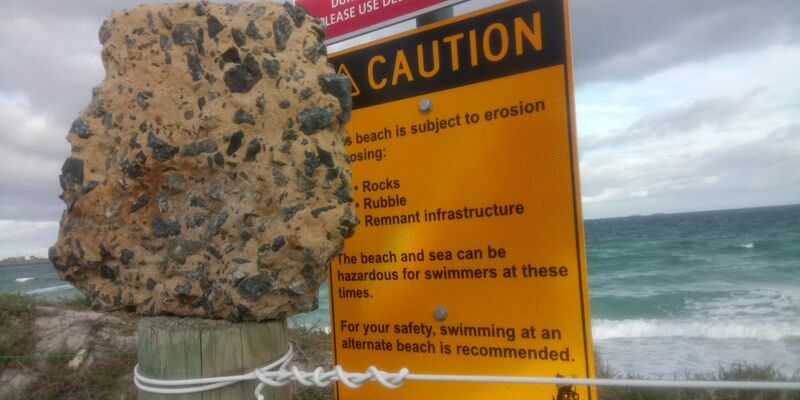 Before Easter, the council put up signs about the new debris’ danger and for swimmers to use alternative beaches. Mr Tattersall said the rocks varied daily, but the signs were permanent for swimmers to be “careful” while the council, the FPA and government departments co-ordinated immediate responses and any long-term measures. Asked for about a future solution, he said the city had asked for a Department of Transport grant, assisted by an FPA contribution, to do a “detailed assessment” of the structures and natural processes at Port Beach that would join the long-tern monitoring of the coast from Rous Head to Cottesloe. However, new limestone in the surf, and rubble and pipes exposed next to a 1991-demolished 1960s fuel depot, prompted beachgoers’ renewed calls for a clean-up – despite them being told by council staff a meeting of managers concluded the work was uneconomic. “Beachgoers, who actually read the signs or have them pointed out are annoyed, disappointed and confused that the City of Fremantle are telling them they shouldn’t be here at the beach they have been coming to all of their lives,” campaigner Peter McLarty said. An FPA spokeswoman said it would share the costs of inspections, asbestos and debris removal and continue monthly monitoring and a hydrographic survey.